These notes are a fuller explanation of the geological trail guide to Dinckley Gorge produced by GeoLancashire and the LGGA (Lancashire Group of the Geologists’ Association). Figure 1a: Topographical map showing locations 1 to 5 with main geological boundaries superimposed. Geological sheet boundary marked with thin blue line. 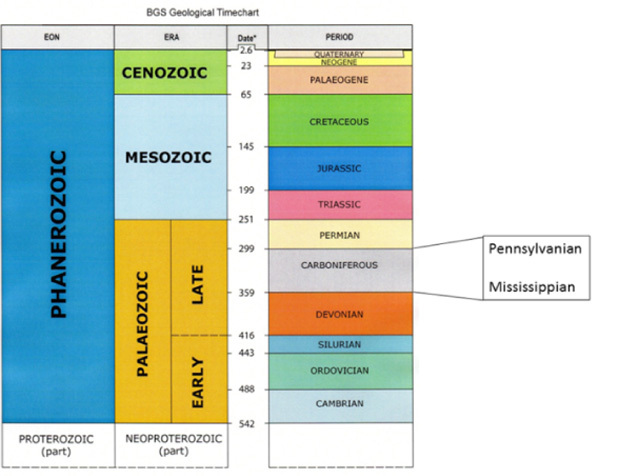 Figure 1a shows the geological boundaries, based on sheets 67 and 68 of the BGS 1:50000 series 1. 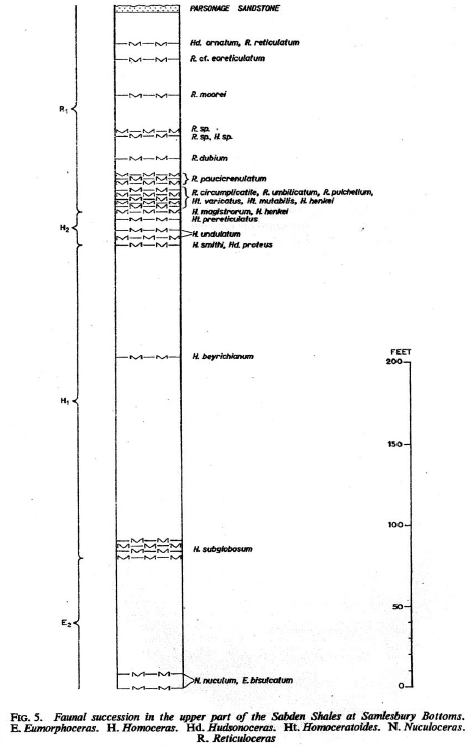 Figure 1b shows the stratigraphy of the Silesian, relevant to Figure 1c. Nomenclature has changed between the creation of the geological map and more recent work. 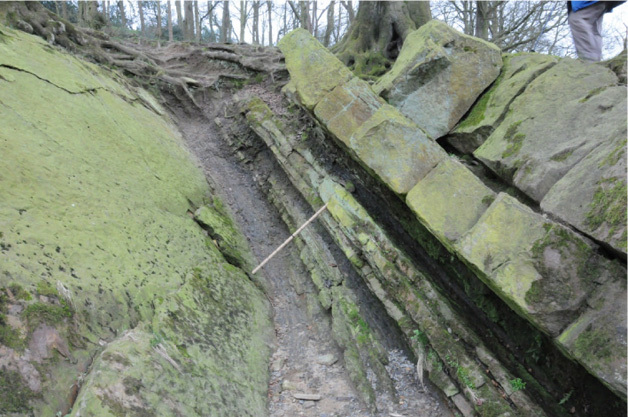 The Upper Bowland Shale Formation in Figure 1b is part of the Bowland Shale Group of Figure 1a. In Figure 1c the Pennsylvanian includes the Silesian shown in Figure 1b. This diagram puts these horizons into a wider context. Figure 1b: Geological column for the Silesian in the neighbourhood of Dinckley Gorge. Note that this column uses the latest, internationally agreed, nomenclature. The Mississippian includes part of the Namurian as well as all of the Dinantian. The current agreed timescale for the Carboniferous is now from 359 to 299 Ma. Note also that the Copster Green Sandstone and Warley Wise Grit are now considered part of the Pendle Grit Formation. There is a free public car park at Marles Wood at approximately SD 675 357, see map above. The excursion is best done when water levels in the Ribble are relatively low. Care should be taken as paths are uneven and slippery, especially in wet/muddy conditions. The footpath from the car park leads straight down onto a small headland, Location 1. There you can see Warley Wise Grit (WWG), composed of layers of coarse sandstone inclined towards the west. They are inclined because of major earth movements which compressed this region about 290 million years ago. Across the river and downstream of the WWG you can see an exposure of Sabden Shales in a small cliff. The Sabden Shales are fine grained mudstones, which lie on top of the WWG and are therefore younger. Both rock types were laid down in a delta, the sandstones in areas where the flow of water was quite rapid. Fast moving water allows fine and coarse sand to be deposited whilst carrying fine mud downstream. Mud may also be deposited further out to sea or on a ‘flood plain’ when a river bursts its banks at times of flood. When these sands and muds were deposited, about 300 million years ago, a large part of northern England was located on a delta similar in size to that of the Mississippi. In deltas there is frequent switching of channels, formation of levées and so on. The complexity of deltaic environments and the wide range of material deposited can make interpretation of the sediments we see today difficult. The rocks which can be seen during this excursion are all of Pendleian, lowest Namurian, age. The Namurian is synonymous with the Millstone Grit. Further south and later, in the Westphalian, forests grew on drier parts of the delta. The decay products of these forests became coals, which brought much prosperity to parts of Lancashire. The Westphalian is synonymous with the Coal Measures. 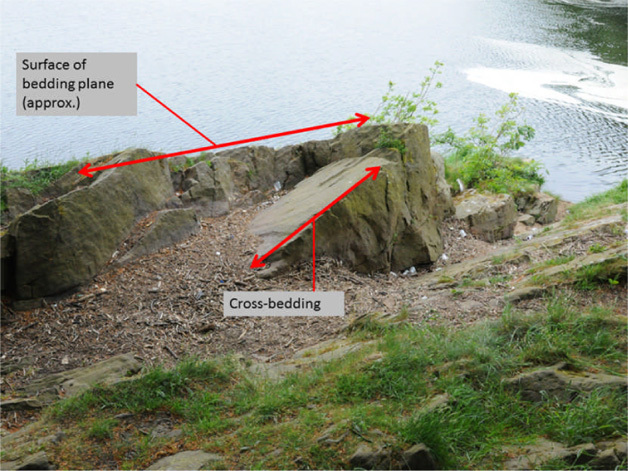 In Location 1, Figure 2, the top sandstone unit of the WWG is cross-bedded and in places trough cross-bedded. This scale of cross-bedding normally results from the migration of subaqueous dunes, which are not confined to marine environments. The BGS interpret the depositional environment of the WWG as delta-top or fluviatile, most probably the lateral equivalent of the Brennand Grit Formation of the Lancaster area. Figure 2: Top unit of WWG showing cross-bedding. The Sabden Shales are fine grained, so it seems likely that there was a rapid and significant increase in relative water level between the deposition of the WWG grit and the Sabden Shales. In recent geological time the less readily eroded WWG has acted as a constraint on the river. As the river leaves this constriction it has eroded a circular pool, the Sales Wheel, in the softer Sabden shales. The name Sales comes from Salix, ‘willow’. Flotsam on the branches of the trees shows that the river level can rise very high when in spate. Gravel extraction in this area means that the pool is, at least in part, man-made. Recent high river flows, probably those of September and October 2012, have built up a substantial crescent shaped shingle bank in Sales Wheel, see section 5 and Figure 20. Clearly this was a good place for gravel extraction as the gravel was regularly replaced. Just a short distance upstream, along the riverside track, further siltstones and mudstones can be seen in small exposures on the river bank or in the bed of the river. If you look closely you can see, on a centimetre scale, alternate layers of sandstone and mudstone, separated by micaceous partings. There is little or no evidence of bioturbation, such as burrows and feeding traces. A few mudstone horizons are very dark coloured. Alternation of sandstone and siltstone/mudstone, of various thicknesses, can be seen in riverside exposures all the way to the suspension bridge at Location 4. Figure 3: Alternating layers of sandstone and siltstone, inclined downwards towards the west. The wooden rod is one metre long. The path enters an open field. From a suitable vantage point you can see, north of the river, a channel indicating a previous course of the river Ribble. It is north of the present course and from it emanates Starling Brook. The course of the channel is best seen on the 1:25000 topographical map. The brook, east of Hay Hurst, turns through a right angle where it joined the old river course. The Copster Green sandstone, which is exposed in the river bank upstream from the woodland and almost opposite Starling Brook, is part of the Pendle Grit Formation. 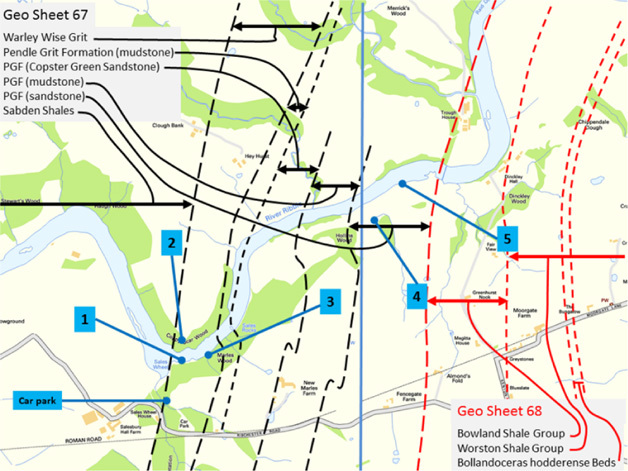 It is shown on the 1:50000 geology sheet number 67, Garstang (1984-1987), but is not mentioned in the 2002 BGS 4th edition of ‘The Pennines and adjacent areas’ nor in the 1998 Lancaster Memoir. It is given Member status in the 1992 Garstang Memoir because of its limited outcrop. Poor exposure precludes precise description of its facies, mode of deposition and relationship to the Pendle Grit above and below it. Copster Green sandstone, which is distinguished by the presence of quartz pebbles, has been used for building in Copster Green and Ribchester. Located between about 100 and 200 metres downstream of the suspension bridge is a shingle bank. If river level permits you can walk on the shingle bank, which is composed of many different rock types. Least common are pebbles of granite. These are erratics, which have been transported to this area from the Lake District and Western Scotland in glaciers and ice-sheets between the glacial maximum 24,000 years ago and the end of the last ice age 10,000 years ago. More common are pebbles of limestone with chert. Chert is a siliceous rock; chert in limestone is equivalent to flint in chalk. In this location chert is found in layers, typically from 20 to 30 millimetres thick, in a limestone sandwich, see Figure 4. Like flint, chert fractures conchoidally and is very hard. The examples in this shingle have been transported from at least as far as Clitheroe and probably a good deal further.. Figure 4: Chert (black to dark grey) in limestone from shingle bank. The chert layer is about 20mm thick. Pebbles of local sandstone and limestone from upstream are abundant. Some of the limestone pebbles contain fossils. 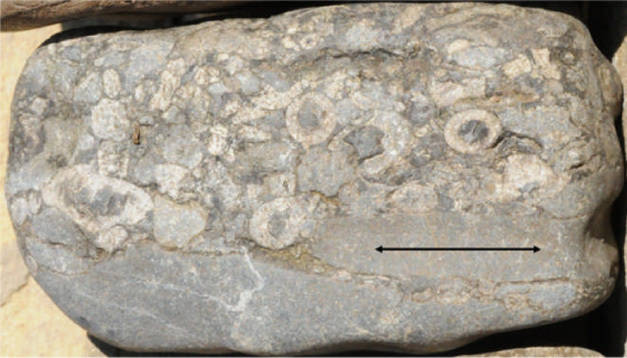 Figure 5 shows a limestone cobble containing fragments of crinoids. Crinoids are animals related to sea urchins, fixed to the seafloor by a ‘stalk’. The arrow marks a calcareous mud clast, suggesting that the crinoid fragments were emplaced as the result of storm processes. Figure 5: Limestone pebble, about 100 millimetres long, with fossil crinoid fragments. It is ossicles, remains of the tubular ‘stalks’ which you can see here. The arrow marks the centre of a limestone mud clast. Fossil crinoid ossicles, which are segments of the crinoid’s stalk, are very common in limestones of the Clitheroe area. These date from the early part of the Carboniferous period, say from 359 to 326Ma. The Crinoids were almost wiped out at 251Ma, the end Permian extinction. Those that survived belong to a subclass Articulata, in which the arms are flexible. 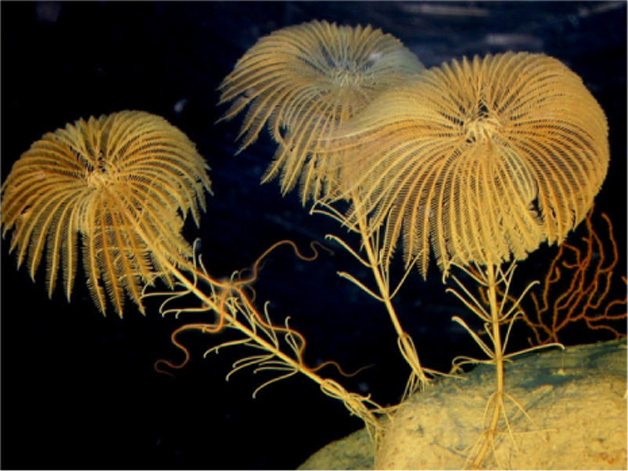 Today some twenty five genera of stalked and ninety genera of unstalked crinoids live in sea water, deep enough for energy levels to be quite low. Their method of feeding is to extract organic detritus and small organisms from the water as it passes through their ‘arms’, so some water movement is required. Crinoids transport their food along their arms to a centrally place mouth. Figure 6A and 6B show examples of living stalked crinoids and Figure 7 an unstalked species from the Red Sea. 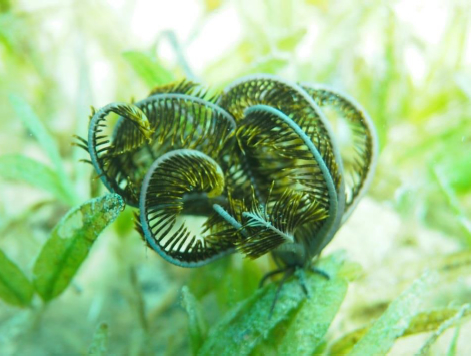 Some modern crinoid species can ‘walk’ by moving the ‘feet’ which secure them to the substrate. 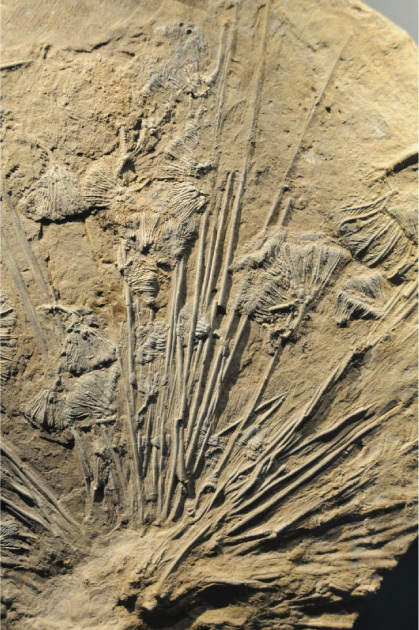 Occasionally spectacular examples of crinoids are preserved as fossils. Figure 8 shows a fossil crinoid with stalk and arms preserved. Figure 7: Living crinoid in the Red Sea, courtesy of Dr Antony Jensen, Ocean and Earth Science, University of Southampton, National Oceanography Centre. If you stand in the middle of the shingle bank and look first upstream and then downstream, the appearance of the shingle differs. Because many of the pebbles are almost flat the process of transport by saltation deposits them at an angle. In the upstream view you see mostly the edges of the pebbles; in the downstream view you see mostly flat surfaces, as shown in Figures 9a and b. This arrangement is known as an imbricate structure and when preserved in ancient rocks geologists use it to infer current direction at the time of deposition. Figure 9a: Imbricate arrangement of flat pebbles; stream direction right to left; white line indicates typical slope of flat pebbles. Figure 9b: Two pictures of the shingle bank below the suspension bridge, one taken facing upstream, right, and the other downstream, left. The flatter pebbles are inclined as in Figure 9a above so you see the surface of flat pebbles looking downstream and their edges looking upstream. Coarse beds of sandstone, part of the Pendle Grit Formation, can be seen just below the bridge, where the more resistant rock layers give rise to small rapids in the river. The Hacking Ferry was located further upstream, in a place unsuitable for a bridge because of the soft Bowland Shales cropping out in the river banks. The bridge was built on a prominent bed of sandstone within the Pendle Grit Formation. For the history of Hacking Ferry see Appendix, section 8. 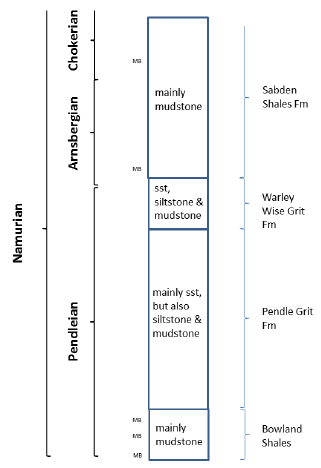 The complete succession from the Bowland Shale Formation to the Sabden Shale Formation falls within the Pendleian substage of the Namurian stage of the Carboniferous, see Figure 10. At this time in the Carboniferous period, relative sea level was influenced by at least three major factors, syndepositional faulting, thermal subsidence and the coming and going of polar ice caps. The faulting and thermal subsidence created the accommodation (which is the available space) for sediment to be deposited. The total thickness of Carboniferous Strata is about 3000 metres, mostly deposited in quite shallow water, as deposition generally kept pace with subsidence. On a much smaller scale, the changing sea level due to the accumulation and melting of polar ice, altered the depositional environment from shallow to deeper water and vice versa. The best known ‘cyclic’ sediments of this time are the Yoredale Series. These were deposited in quite shallow water, so at times of high relative sea level limestone was deposited and at times of low relative sea level erosion took place and terrestrial sediments were depositied. Much of the Pendleian succession at Dinckley is the lateral equivalent of Yoredale sediments but the Pendleian sediments were deposited near the mouth of a major river system flowing from the north. Sand was deposited when energy levels were high, while a much lower energy level was required for the deposition of mud. River deltas with distributaries which meander and change course provide many different depositional environments. Because of a lack of fossils such sand and mud rocks are difficult to date, but fortunately there were occasional periods when relative sea level was high and muds containing the remains of marine organisms were deposited. Goniatites, which are marine ammonoid molluscs, evolved rapidly over this period and the ornament on their shells changed over time. The fossilised remains of these goniatites provide a relative time scale and the strata in which they are found are called marine bands. For an example of a goniatite see Figure 11. The Pendle Grit was deposited in relatively long and narrow submarine channels, recognised mainly by basal erosional contacts. A modern analogue for this style of deposition is the Bute Inlet in British Columbia, Canada. In this environment small lobes of sand are located at the distal end of the channel with a short transition to basinal mud. The Pendle Grit is feldspathic, which means that the sediment has been transported from a granitic source area so rapidly that there has been insufficient time for the breakdown of feldspars by weathering. 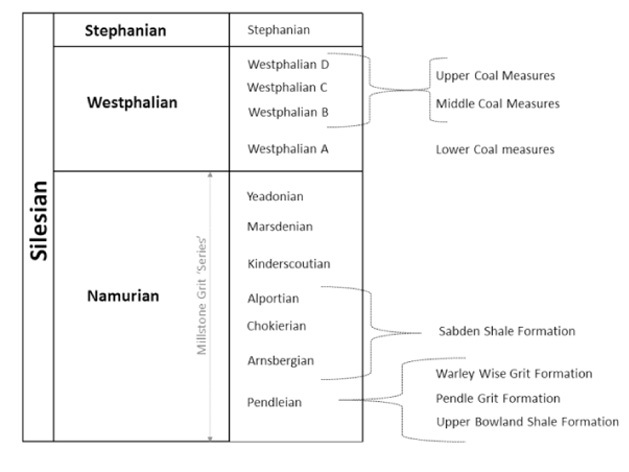 Figure 12: Schematic cross section showing total thickness of Namurian strata, based on a comprehensive section in British Regional Geology, The Pennines and Adjacent areas 7. The Askrigg block is to the left (north side) of the section. In the schematic cross section of Figure 12 the approximate location of the Dinckley Gorge sediments can be seen. 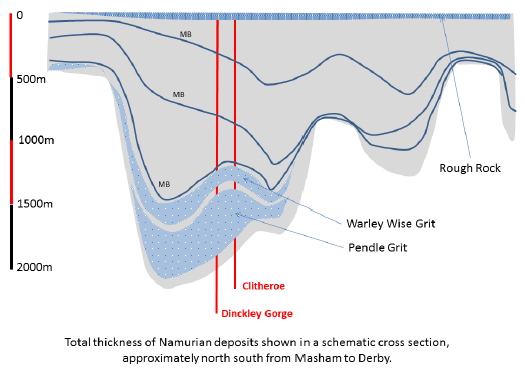 The difference in thickness of Namurian sediment reflects both original topography and subsidence, which was much less in the area of the Askrigg Block, a massif underpinned by the Wensleydale Granite. The variation in thickness shows how the depositional environment evolved during the Namurian. 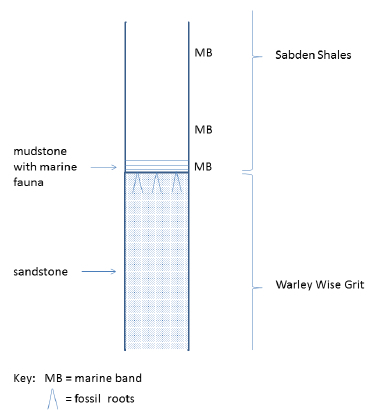 The Pendle Grit was deposited in the lower part when basinal topography inherited from the Dinantian was dominant; the Warley Wise Grit was deposited on top of the Pendle Grit but over a somewhat wider area. The Rough Rock, at the top of the Namurian, was deposited over the whole length of the section shown and provides evidence that by then the basin was substantially filled up with sediment and little submarine topography remained. In Figure 12 three marine bands have been shown for illustrative purposes. Without marine bands, relative dating would not be possible. Marine bands are therefore of fundamental importance in Namurian basin analysis. Figure 13: Section of strata of early Namurian (Pendleian) age in the Dinckley Gorge river bank. The exposure is not continuous, although more might be visible at very low river levels. See Garstang Memoir 8 for stratigraphic details. The Copster Green sandstone is not easily differentiated. It consists of an interbedded pebbly sandstone. Its facies is uncertain, whereas that of the WWG is described as fluviatile, consistent with the interpretation that it is delta top facies. The exposure is not continuous (Figure 13) so interpretation is difficult. The WWG is thought to be the lateral equivalent of the Brennand Grit of the districts to the north. The Pendle Grit is described as a ‘turbidite fan complex’. This requires some explanation. The traditional view of a turbidite was that it represented an ‘event deposit’ such as would be derived from an underwater landslip arising from an earthquake. This led to the widely known description of the resulting deposits known as the Bouma sequence. Today the Bouma model for turbidites is seen to be much too restrictive in that it fails to encompass a wide range of turbiditic deposits which are not event deposits. Turbidites may be formed from a continuous supply of sediment, of days’ or weeks’ duration, such as would occur when a river in flood carries large volumes of sand over the shelf break. Some of that sand may have been reworked from the shelf as the river in flood eroded a deeper or wider channel. Sediments resulting from this process do not have the characteristics of the Bouma sequence. The base of the Sabden Shales contains marine fossils. Clearly relative sea level deepened between the deposition of the WWG and the Sabden Shales and the supply of coarse grained sediment was cut off. Some of the black shales within this succession are laminated or at least very little disturbed by burrowing. Mud provides nutrients, so the paucity of burrowing organisms needs to be explained. In addition the marine bands preserve goniatites which have been little damaged by sea floor biota. Fossilised plant fragments are also preserved in some horizons. One mechanism for preservation of goniatites and other organic matter is a low level of oxygen in the water adjacent to the sea floor. Another is early cementation with calcite. Both preservation mechanisms occurred In Silesian marine bands. If no free oxygen is present the environment is described as anoxic. For simplicity the word anoxic will be used here for both anoxic and depleted-oxygen environments. The Black Sea, which is up to 2200m deep and an example of a silled basin, is anoxic at the sediment-water interface. 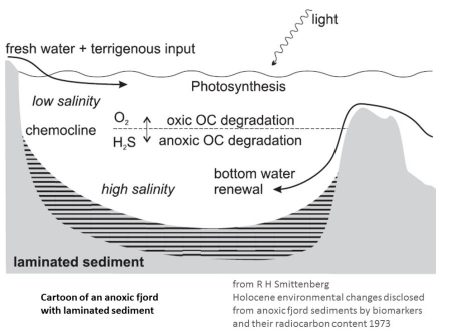 A schematic of a fjord with anoxia at the sediment-water interface is shown in Figure 15. Other modern examples of silled basins can be found in the Californian borderland. Note that high salinity water from the ocean is denser than fresh water, so the bottom water has high salinity and tends to be undisturbed, at least on a short term basis. Anoxia is promoted by influx of organic matter, which uses oxygen in decay processes. Under anoxic conditions sulfate-reducing bacteria give rise to H2S, which is toxic to most organisms (including us) and is likely to lead to the formation of pyrite. The Baltic Sea has extensive areas of sea floor hypoxia (oxygen levels which are sufficiently low that life forms are very severely restricted). It is a rimmed basin with a marked water density change, a halocline, from 7-8‰ (parts per thousand) to 11-13‰ at a depth of between 60 and 80 metres. The Baltic hypoxic area increased from 11000km2 in 1993 to 60000km2 in 1999 and because of its impact on fishing etc. has become a source of major concern. Anoxic conditions may be periodic, alternating with conditions where oxygen is present at the sediment-water interface. Data from Greenland ice cores suggest that anoxic cycles correlate well with rapid climate excursions which lead to changes in ocean current patterns, upwelling of nutrients and high organic productivity. Figure 16 is adapted from Leeder 11. It illustrates the change in depositional fabric of sediments in the Santa Barbara basin related to oxygen levels at the sediment-water interface. When oxygen concentration is normal the sediment is bioturbated. It should be noted that when anoxic conditions exist within the sediment and the water is oxic, burrowing organisms allow oxygen to permeate the upper levels of the sediment. 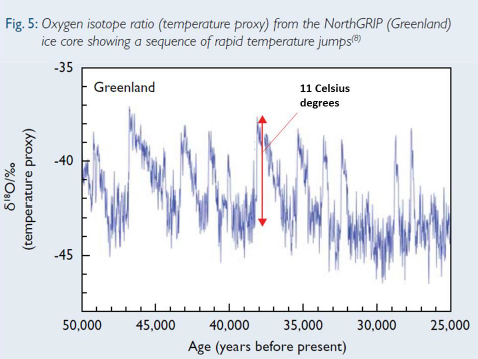 Figure 17: Temperature proxy versus time, over a 25,000 year period, derived from oxygen isotopes in a Greenland ice core. Note that less negative δ18O 0/00 correlates with higher temperatures. The graph also shows that warming is always much more rapid than cooling. Figure 18 below is based on a figure in Leeder11. For the late-Pleistocene to Holocene period it shows, on the left side, periodic warm interstadial excursions identified from Greenland ice cores. On the right side it shows the stratigraphic record of anoxic laminated sediments seen in cores from a Californian borderland silled basin. The time of rapid increase in temperature and low bioturbation index are correlated. The relationship may reflect changes in ocean currents and upwelling of nutrients. Note the asymmetry of the cycles, rapid warming and slow cooling. 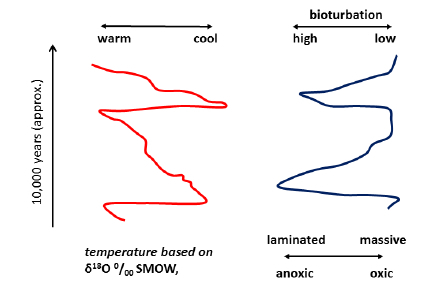 Low bioturbation correlates with times of rapid increase in temperature. Figure 18: Adapted from Leeder 11, (SMOW = standard mean oceanic water; δ18O 0/00 is the difference in the proportion of the heavy oxygen isotope from SMOW). It is also possible to have anoxia in a non-saline lake environment. In that case stratification of the water column is thermal and may be periodic. In the summer the top waters are warmer and therefore less dense so little mixing occurs. In the winter the top water may become sufficiently cool that it flows to the basin floor and brings oxygenated water to the sediment water interface. Figure 19 is a diagrammatic model of conditions in summer, when warm surface water flows over cool deeper water and there is no mixing across the thermocline. Figure 19: Model for deposition in a non-saline lake with an annual ‘depleted oxygen’ environment in the summer due to thermal stratification. 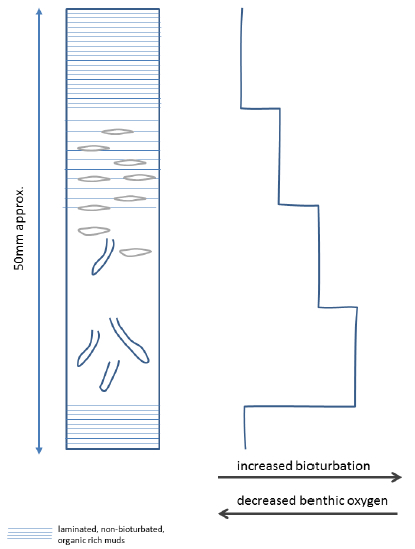 Diagram based on a figure from Carbonate Sedimentology by Tucker and Wright 12. Note the transition from bioturbated mud to laminated mud across the boundary between warm oxygenated water (mixed by wind action) and cooler oxygen-depleted water. This is not to say that above models apply to the deposition of marine bands in the Namurian, but the preservation of fossils in marine bands is certainly evidence of anoxic, or at least very low oxygen, conditions at the sediment water interface. 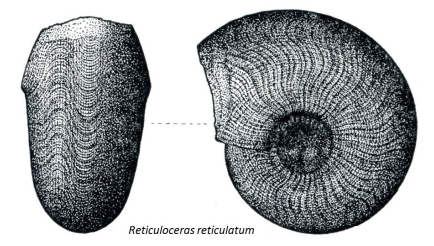 There are 49 marine bands within the Namurian succession, each named after the key ammonoid mollusc present. Unburrowed, laminated organic carbon rich black shales are evidence of oxygen-depleted depositional environments. Marine bands are black shales, but not all black shales are marine bands. The following explanation is largely based on Wignall14. During the late Carboniferous a Caledonian mountain range to the north and north-west of England was undergoing rapid erosion and supplying large volumes of sediment into the basin. An island to the south, the Wales-Brabant massif, effectively isolated the water bodies to the north from marine influence. When relative sea level rose, conditions in the basin became marine but connection with the ‘open sea’ was limited. Sea level rise and fall in the Namurian is widely believed to be driven by glaciations caused by Milankovitch cycles. Data from recent glaciations shows that sea level rise is very much more rapid than sea level fall. It was during rapid rises in relative sea level, called marine transgressions, that black shales were deposited. The sediment water interface at the time of maximum rate of sea level rise is called the maximum flooding surface (MFS) and it is on this surface that black shales are deposited. The rate of deposition is slow, ‘sediment starved’, and the resulting strata are known as a condensed section. Towards the basin margin the black shales grade into silts and sandstones. The precise reasons for sea bed anoxia are enigmatic. Once again the term anoxic will be used here as a shorthand for both anoxic and depleted-oxygen environments. What is clear is that deposits of black shale in the geological record are mainly located within intra-continental basins. They are also associated with marine transgressions and are found on the deeper parts of shelves and in restricted basins. Potential causes of anoxia include temperature and/or density stratification of the water column and high organic productivity. In the top 100m of the water column the amount of dissolved oxygen reduces with depth, as oxygen is used up in decay of organic matter and is not replenished by processes that homogenise the water column. The surface levels maintain high oxygen levels by dissolution of atmospheric oxygen. High organic productivity depends on the availability of light and nutrients, especially nitrates and phosphates, ample quantities of which would be supplied from the hinterland. Ultimately the relative supply of organic matter and oxygen at the sea floor determined whether conditions there were oxic or anoxic. Under anoxic conditions pyrite (FeS2) is formed in the sulfate reduction zone, located a short distance below the sediment water interface. Deeper, in the methane reduction zone carbonate (CaCO3)nodules may be formed. Marine band fossils, such as goniatites, are sometimes preserved in carbonate. In non-marine anoxic depositional environments sulfate concentrations are low and the sulfate reduction zone is absent. Under these conditions siderite (FeCO3) will be formed. Unsurprisingly there is no evidence of siderite in marine bands. On a visit to the site in March 2012 the author took a photograph across Sales Wheel. In early November of the same year he took another photograph which showed a significant shingle bank, not present previously. The river level was low at the time of the first picture and somewhat higher at the time of the second. Heavy rains and high river flows, especially during September and October 2012, are likely to have been responsible for the creation of the Sales Wheel shingle bank. The two photographs, Figure 20, were not taken from precisely the same position but the rocky bank to the left of the shingle bank is a common landmark. Located just to the left of the shingle bank is one almost square boulder which catches the light in both images. Figure 20: Upper: Sales Wheel in March 2012. Lower: Sales Wheel in November 2012, with a shingle bank emplaced by high flow rates in the River Ribble. In spring 2013, with kind permission of the landowner, the shingle bank was examined. Several granitic erratics were found. Also found were rather fragile blocks of mudstone up to about 400mm across. These readily delaminated to reveal abundant goniatites, preserved on bedding planes. 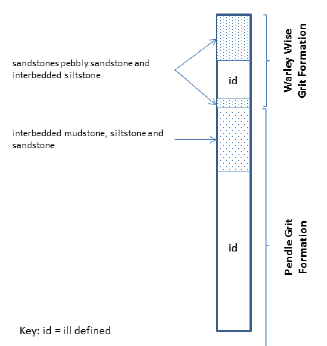 The BGS Lexicon of Named Rock Units, at http://www.bgs.ac.uk/lexicon/, cites the Sales Wheel Gorge section as the ‘reference sections’ (NB not type sections) for both the PG (Pendle Grit) and WWG (Warley Wise Grit). The Roman road to Ribchester passes along the line of the road between SD677356 and SD681357. A portion of road was exposed during the construction of Marles Wood car park. Brenchley P J and Harper A T, 1998. Palaeoecology, Chapman & Hall. 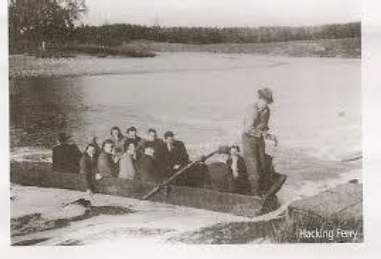 The Hacking Ferry or Hacking Boat, as it was commonly called, was used to ferry people across the River Ribble were it joins the Calder opposite Calder Hall. Historians date the first ferry service at around 1686 but in more recent times, the boat was used to carry holiday makers and ramblers across the river. The boat did not operate a regular service. If you wanted to cross the river you had to call for the boat man and pay about two or three pence each journey. The last boat was taken out of service in 1938 but was still used occasionally, until it ceased to operate in 1955. The last ferry, which was built in the 1920’s, is in Clitheroe Castle Museum. The Ribble Valley Chief Executive, Michael Jackson, found it rotting in a barn at Hacking Hall. It may well be that the gothic landscapes of Lord of the Rings are pure invention but it seems reasonable to deduce that the author developed them from his visits to the gentle and little-known part of northern England, where he wrote thousands of words and enjoyed many a pint of real ale. The Forest of Bowland strides the hilly border between Lancashire and Yorkshire. It is a place of ancient manor houses, silver streams, gnarled trees, hidden valleys and distant peaks. This is the mirror image of Tolkien’s Shire. Tolkien frequently visited Bowland in the 1940s when his eldest son John was studying for the priesthood at Stonyhurst, the former Jesuit seminary that is now perhaps the world’s leading Roman Catholic boarding school. It is known that he wrote much of his great work during his lengthy stays here. Almost certainly Tolkien framed his Hobbiton from Hurst Green, a lovely little village of mellow stone just a few minutes’ walk from Stonyhurst. The woods around today’s Mitton Hall were surely adapted by the author as the Old Forest; his Bucklebury Ferry across the Brandywine River just has to be the spot where in Tolkien’s day the Hacking Boat took passengers across the Ribble River. Tolkien’s Brandywine Bridge carried the Great East Road across the river, and in his works dwarves crossed the bridge on their way to the mines in the Blue Mountains. 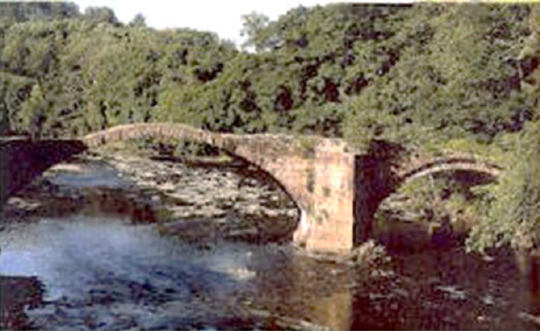 Today a modern bridge crosses the Hodder River, and close by is the semi-ruined Cromwell’s Bridge, also known as the Devil’s Bridge. It’s easy to imagine grimy little dwarves returning across this ancient structure. This is a green and pleasant land, its cattle pastures still under-populated after the recent ravages of foot and mouth disease. 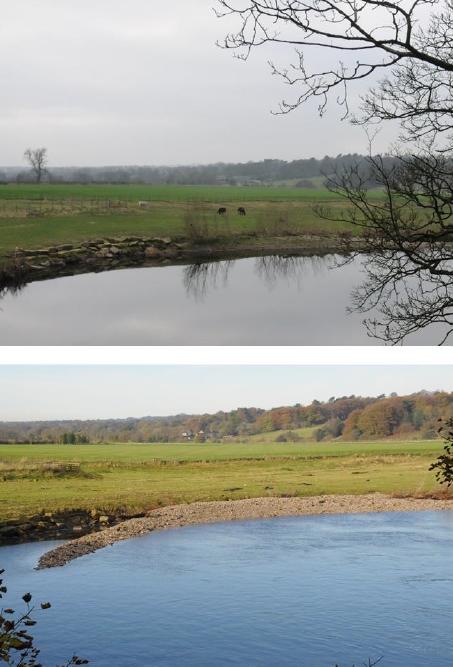 There are three rivers – the Hodder and Calder joining the larger Ribble, which runs over gravel beds past Roman ruins at Ribchester before flowing into the Irish Sea beyond Preston. Bowland is the exact centre of the United Kingdom, confirmed by a plaque on a telephone box at Dunsop Bridge. It was unveiled in 1992 by Sir Ranulph Fiennes, famous explorer and father of film stars. Thus, it is literally Britain’s Middle-earth.